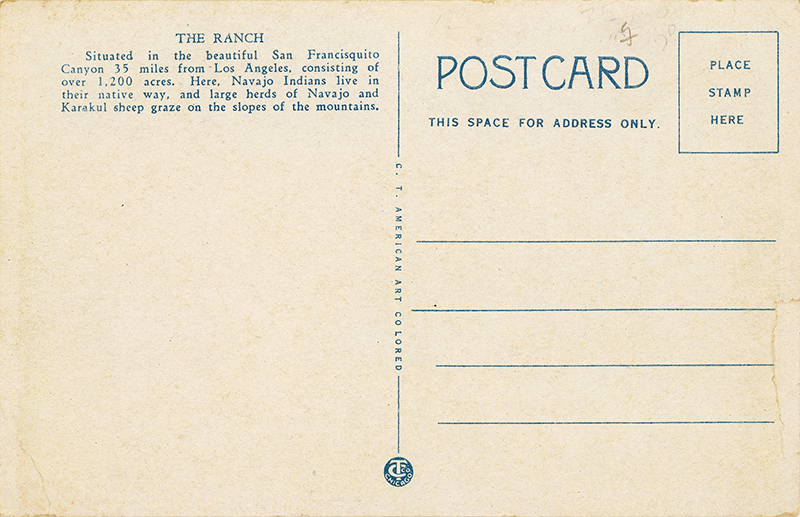 SCVHistory.com LW2087 | Harry Carey Ranch | Postcard, Ranch & Trading Post, 1920s. Situated in the beautiful San Francisquito Canyon 35 miles from Los Angeles, consisting of over 1,200 acres. Here, Navajo Indians live in their native way, and large herds of Navajo and Karakul sheep graze on the slopes of the mountains. The wood-frame Carey ranch house, built before 1921, is left of center and includes a wood-frame pump house with water tanks supported on its roof. It was in this pump house that a fire started in September 1932, claiming the ranch house, which would be rebuilt in Spanish adobe style. The original wooden ranch home may not actually have had a red roof as shown here; this postcard, by C.T. American Art Colored of Chicago, is colorized. Moving to the right in the photo, at top is probably the adobe "upper garage" built around 1925 (thus the estimation of the date of the photo, 1925-28, the latter being the year of the St. Francis Dam disaster.) Continuing to the right, a very small structure with a tall smokestack or chimney is probably the adobe smokehouse. The long building next to it may be an adobe chicken house later converted into stables. In the foreground, the wood-frame stable, known as the "wood stables," was later enlarged. The corral is now gone, as is the wood-frame building in the lower right-hand corner. 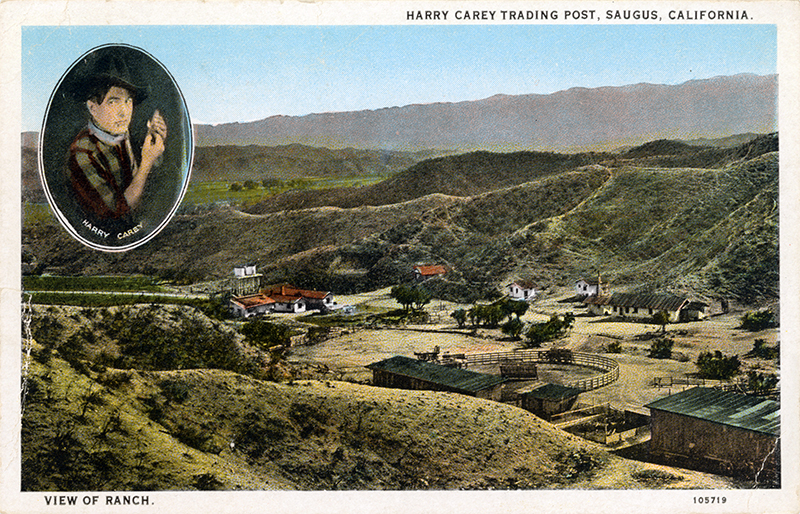 Despite the title of the postcard, the Harry Carey Trading Post is not shown in this photo. It probably stood about a quarter-mile southeasterly from the rest of the ranch (out of the picture to the left). Nor is the caretaker's house shown; it stood about a half-mile southeasterly at the front gate on San Francisquito Canyon Road.